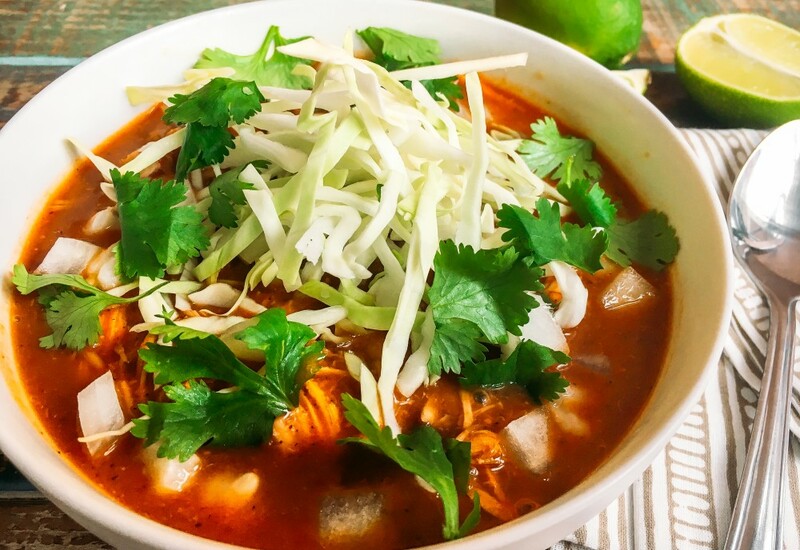 Posole is traditionally made with pork, but this recipe uses chicken for a healthier twist on the rich and flavorful soup. It was once thought to have been a special dish to the Aztecs, who held maize (or corn) as a sacred plant. Today, the classic Mexican comfort food uses hominy (dried corn kernels) to add body and warmth to a dish that's still served on many special occasions. Posole is a perfect way to feed a crowd—serve on its own, or with rice and beans or cheese quesadillas for a filling dinner. Let guests add toppings like cabbage and cilantro to their portions as they like. Dried guajillo and ancho chiles add a unique smoky, slightly spicy flavor to the posole broth. You can find them in Mexican markets, gourmet stores or spice shops. Use them to flavor a pot of dried beans, or simmer in other soups and stews to add a bit of spice. Per Serving: 492 calories; 17g fat; 18.5g carbohydrates; 63g protein; 166mg cholesterol; 1966mg sodium. This was my first time making chicken posole soup and it was so good! Hominy is really delicious, I'm not sure why I don't cook with it more often. The flavors in this soup were perfect, I love everything about it. This soup is very hearty, rich, and flavorful. Comfort food in a bowl! It's also gluten and dairy free, win! Can't wait to make this again.